Ectropion, or out-turning, of the eyelid usually involves the lower eyelid. The lower eyelid pulls away from the eye and visibly appears to sag down. Most of the time, ectropion occurs along with the general aging changes in the skin. 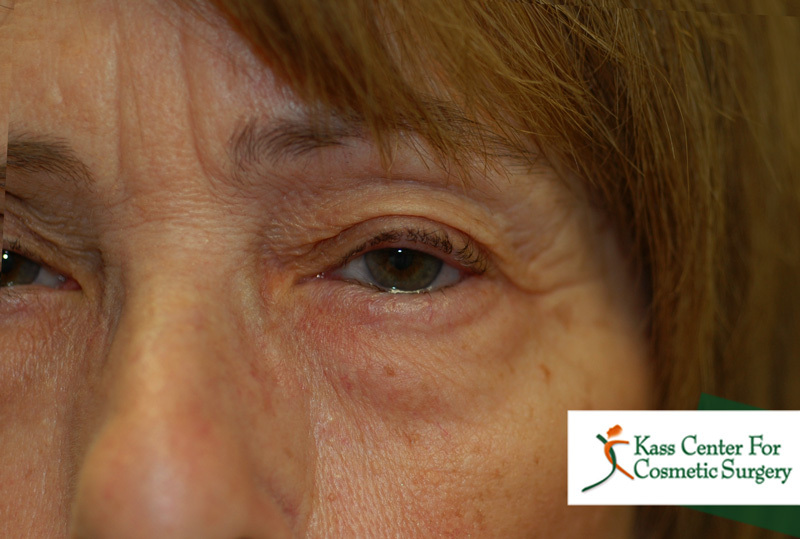 The lower eyelid can become looser, and eventually pull away from the eye by gravity. Bell’s Palsy, or a temporary paralysis of the side of the face, can suddenly make these normal aging changes much worse, and the eye can become severely dry due to ectropion. 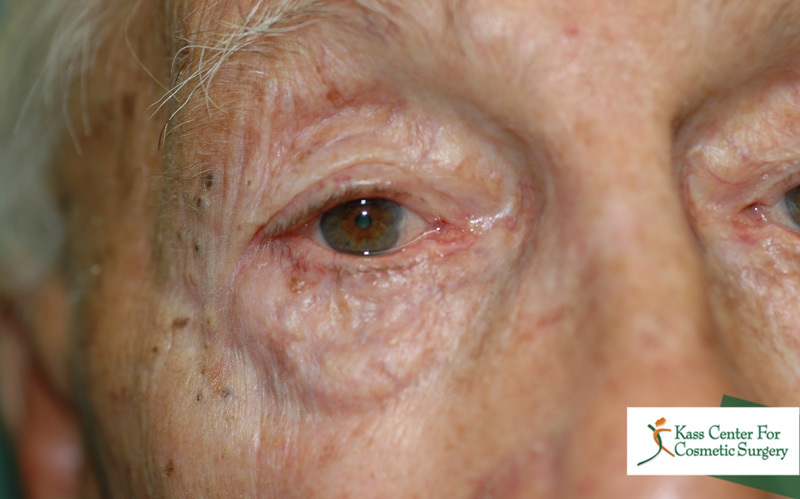 Other conditions lead to scarring of the skin under the eyelid, which pulls the eyelid away from the eye. Symptoms include irritation, swelling, and redness of the eyelid, tearing, and irritation and redness of the eye. The lower eyelid is usually pressed flush against the eye and keeps the eye bathed in lubricating tears. When the eyelid sags away, so do the tears, and the eye can become severely dry. Tearing occurs if the opening in the eyelid which drains tears away becomes separated from the eye. Thus, tears have no way to drain away except onto the face. Dryness of the cornea can lead to a scratchy sensation, redness of the eye, pain, and blurred vision. Sometimes the cornea can become infected. With ectropion, the eyelids are turned out and so they don’t close or function properly. Normally when you blink, your eyelids move tears across the surface of your eye to the little openings – called puncta – at the inner part of your eyelids. These tears then drain through the puncta into the nose. With ectropion, your eyelids aren’t flush against the surface of your eye, so they can’t move tears to the puncta as effectively as they should. Tears pool in the corners of your eyes and instead of lubricating your eyes, they flow over your lid onto your cheek. Also, because your eyelids are turned out, they don`t properly protect your eyes. As a result, the inside of your eyelids and surface of your eyes are exposed to air and can become dry, irritated and inflamed. Rubbing your eyes in an attempt to relieve symptoms can lead to further irritation, mucous discharge and encrusted eyelids. The eyelids are meant to protect the eyes and to preserve vision, and they are unable to do so if there is ectropion. The real concern for patients with ectropion is loss of transparency of the cornea and subsequent loss of vision if the eyelid malposition is not corrected in a timely fashion. While lubricating drops and ointments can provide temporary relief, eyelid surgery is usually necessary. The ectropion repair procedure is usually performed as an outpatient (there is usually no need for hospitalization). Local anesthesia, which numbs the eyelid, is combining with light sedation so there is little, if any, pain during or even after the procedure. To effectively treat ectropion requires a special understanding of the anatomy and pathophysiology of the eyelid. It is in your best interested to keep in mind that although General Plastic Surgeons are trained to do certain types of procedures, such as a tummy tuck, they have not been trained in eyelid anatomy or pathophysiology. You should choose to have this procedure done by a Doctor who is a fully fellowship trained Oculofacial Surgeon. Fellowship in the American Society of Oculofacial Plastic and Reconstructive Surgery assures that the plastic surgeon has every piece of specialized training and expertise in this sub-specialty. 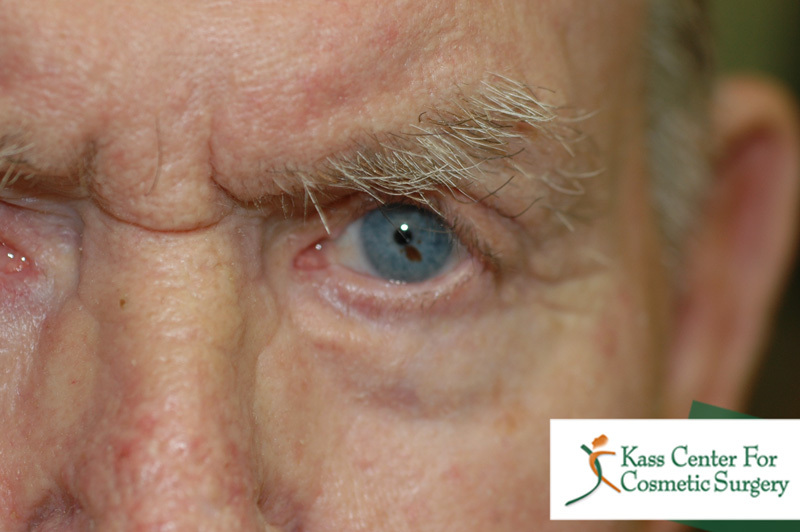 If you have ectropion, please contact us at the Kass Center where Dr. Kass, with over 3 decades of experience in this matter, would be more than happy to assist you. Entropion, or in-turning, of the eyelid can involve the upper or lower eyelid. 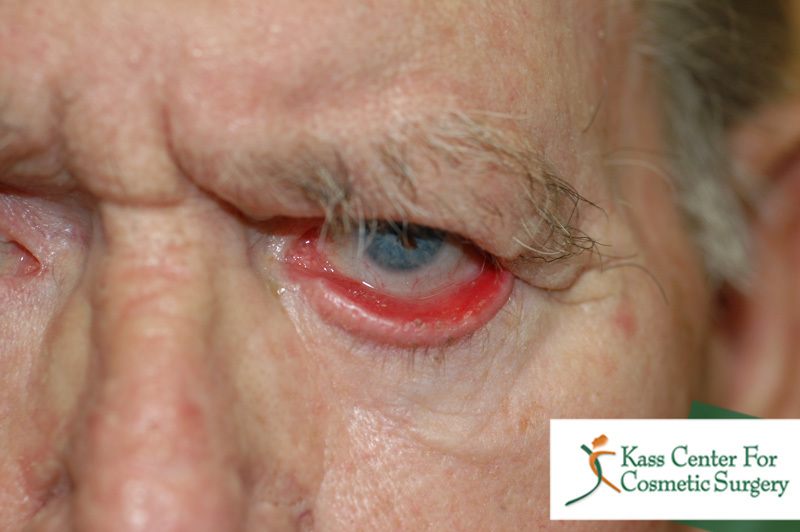 Symptoms occur due to the scratching of the eye by the inwardly pointing eyelashes (trichiasis). Usually numerous eyelashes are involved, and it is impractical to pull all of them. 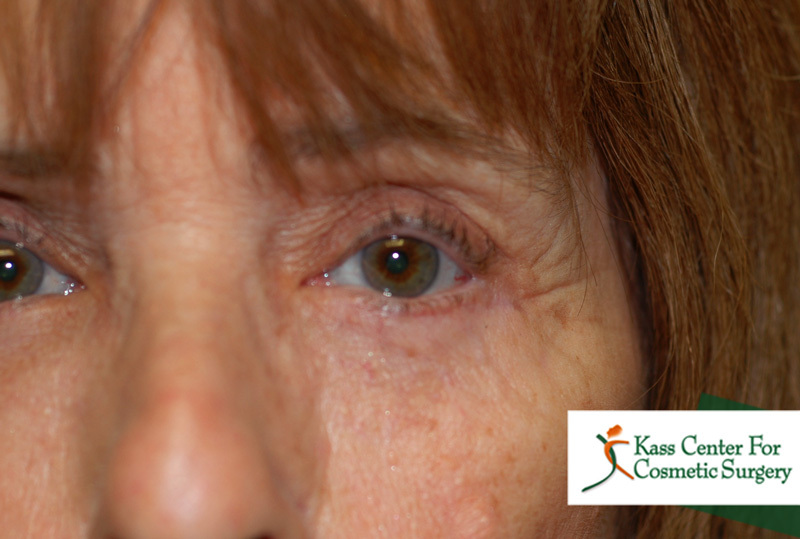 This condition can occur due to generalized aging, which can cause changing in the eyelid with a gradual rotation inward. 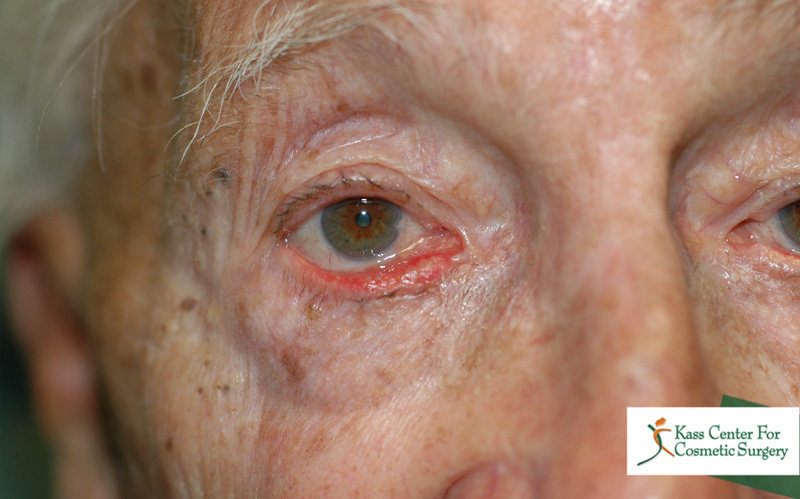 Other cases are caused by scarring, either from trauma, infection, or an inflammatory condition such as shingles of the eyelid. Entropion can cause irritation to the eyelid and the eye. This can result in excessive tearing, crusting of the eyelid and mucus discharge, a feeling that something is in the eye, irritation of the cornea and impaired vision. Damage to the cornea (the clear part of the eye that allows light to enter the eye), including infection and scarring, may develop due to the chronically turned-in eyelid. These are important reasons for having this condition repaired before permanent damage occurs to the eye. The eyelids are meant to protect the eyes and to preserve vision, and they are unable to do so if there is entropion. The real concern for patients with entropion is loss of transparency of the cornea and subsequent loss of vision if the eyelid malposition is not corrected in a timely fashion. In the case of acute spastic entropion, the treatment is directed to the provoking stimulus e.g. in growing eyelashes, blepharitis, dry eye. Although a bandage contact lens or botulinum toxin injections may improve symptoms temporarily, these are rarely justified. The use of lower lid tape can be advised for use in primary care while the patient is waiting to be seen by an oculo-facial specialist. While lubricating drops and ointments can provide temporary relief, eyelid surgery is usually necessary. The entropion repair procedure is usually performed as an outpatient (there is usually no need for hospitalization). Local anesthesia, which numbs the eyelid, is combining with light sedation so there is little, if any, pain during or even after the procedure. To effectively treat entropion requires a special understanding of the anatomy and pathophysiology of the eyelid. When choosing a Plastic Surgeon to take care of this procedure, it is important to make sure they are a fully trained fellowship Oculofacial Surgeon, such as Dr. Kass. If you have entropion, please consult with Dr. Kass at The Kass Center for Cosmetic Surgery who is fully trained to treat this problem and has been in practice in the Tampa Bay area for over 30 years.